Last Gasp: Put a random action into your hand. 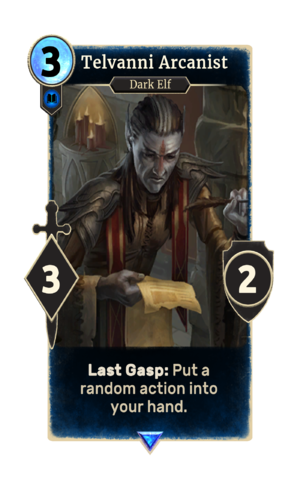 Telvanni Arcanist is a rare Intelligence creature card. It is part of the Core Set. "You are no match for House Telvanni!" "The ambition of the Telvanni knows no bounds!" "You dare face a wizard lord?" "You have forsworn your life!" The card is named for House Telvanni, one of the Great Houses of Morrowind. This page was last modified on 14 February 2019, at 23:51.